R.C. Sproul Collection Volume 2: The Essential Truths of the Christian Faith / Now, That's a Good Question! This Collection bundles two of popular and accessible theologian R. C. Sproul's works into one e-book for a great value! For those who yearn for a deeper walk in faith, their journey can begin here. Dr. Sproul takes theology down off of the dusty shelves of theological libraries and expounds in clear and simple terms over one hundred major Christian doctrines. He offers readers a basic understanding of the Christian faith that will kindle a lifelong love for truth, which is foundational to maturity in Christ. Here are theologically sound explanations of the biblical concepts every Christian should know, written in a way that we can all understand. Sproul's homespun analogies and illustrations from everyday life make this book interesting, informative, and easy to read. Now That's a Good Question! answers more than 300 challenging questions about life and faith. Sproul, a distinguished theologian and educator, address doctrinal points and contemporary issues such as euthanasia, evolution, and abortion. His answers cover over three hundred topics in a personable, easy-to-read style that's perfect for the lay person. New believers as well as those older in the faith will find this book a great resource for those challenging questions of life and faith. About "R.C. 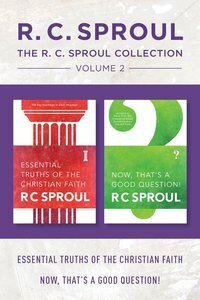 Sproul Collection Volume 2: The Essential Truths of the Christian Faith / Now, That's a Good Question!"